University of California (Santa Cruz) Professor W. Jackson Davis (Ph.D.), President of the Environmental Studies Institute, has published a new paper with colleagues in the journal Climate that thoroughly undermines the conceptualization of a dominant role for anthropogenic CO2 in the global warming since 1850. Davis points out that CO2 and global temperature have been “decoupled” throughout much of geological history, and that the amplification of CO2 concentrations yields increasingly smaller radiative effects, meaning that the higher the CO2 concentration rises, the weaker its influence. He even suggests that the reason why the anthropogenic global warming (AGW) hypothesis (it has not reached theoretical status) has been popularized is because there are reputed to be no convincing alternative explanations. But Davis and two other University of California (SC) scientists have proposed a newly-termed alternative explanation for the 0.8°C global temperature change since 1850. The Antarctic Centennial Oscillation (ACO) has been identified as varying in sync with solar cycles (orbital), and correlates with glacial-interglacial transitions, the 1,500-year abrupt, global-scale temperature changes (Dansgaard-Oeschger cycles), and, as the name suggests, century-scale fluctuations in global temperature. Consequently, as the authors conclude, properties of the ACO “can explain the current global warming signal”. The anthropogenic global warming (AGW) hypothesis has been embraced partly because “…there is no convincing alternative explanation…” [USGCRP, 2017] (p. 12). 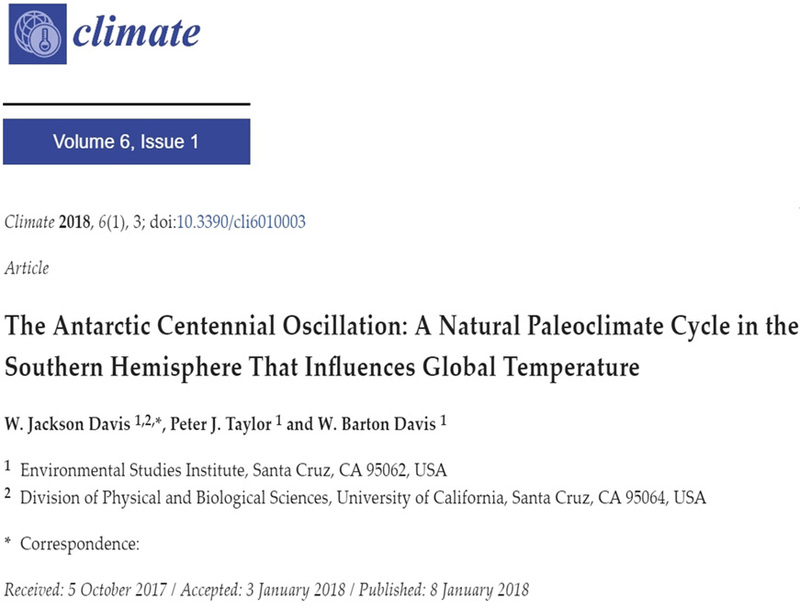 The ACO provides a possible alternative explanation in the form of a natural climate cycle that arises in Antarctica, propagates northward to influence global temperature, and peaks on a predictable centennial timetable. We report a previously-unexplored natural temperature cycle recorded in ice cores from Antarctica—the Antarctic Centennial Oscillation (ACO)—that has oscillated for at least the last 226 millennia. Here we document the properties of the ACO and provide an initial assessment of its role in global climate. We analyzed open-source databases of stable isotopes of oxygen and hydrogen as proxies for paleo-temperatures. We find that centennial-scale spectral peaks from temperature-proxy records at Vostok over the last 10,000 years occur at the same frequencies (±2.4%) in three other paleoclimate records from drill sites distributed widely across the East Antarctic Plateau (EAP), and >98% of individual ACOs evaluated at Vostok match 1:1 with homologous cycles at the other three EAP drill sites and conversely. The period and amplitude of ACOs oscillate in phase with glacial cycles and related surface insolation associated with planetary orbital forces. We conclude that the ACO: encompasses at least the EAP; is the proximate source of D-O oscillations in the Northern Hemisphere; therefore affects global temperature; propagates with increased velocity as temperature increases; doubled in intensity over geologic time; is modulated by global temperature variations associated with planetary orbital cycles; and is the probable paleoclimate precursor of the contemporary Antarctic Oscillation (AAO). Properties of the ACO/AAO are capable of explaining the current global warming signal. Last paragraph of the conclusion they state that, even though CO2 has nothing to do with global warming, the close correlation between CO2 spikes and mass extinctions (possibly from ocean acidification) suggests that humanity should pursue ways of limiting growth of CO2 release. I wondered how they managed to get their paper published. Interesting that you guys (Kenneth below) see mentions of CO2 as a problem or calling the warming what it is as necessary in todays scientific world to get published and those phrases not really being the opinion of those scientists. That borders on conspiracy thinking … and you wonder why nobody takes you serious? Why do you dismiss it as a “conspiracy” to point out that there is a clear bias in the favor of pro-CO2 mitigation policy in the scientific literature? At what point does the bias stop and the “conspiracy” begin, especially since we have ClimateGate e-mails that confirm this bias against non-conforming papers? And you keep on claiming that there are skeptics here who have wondered in writing why “nobody takes [us] seriously”. I can’t recall anyone here lamenting that we’re not taken seriously…or anything close to it. Or are you just making this up as a rhetorical tactic? Speaking of, you have claimed that you can “only find data” from satellites that supports your belief that the Earth’s deserts are expanding and the land masses are browning instead of greening. I have asked you about 5 times to identify this “data” that you have found to support your belief, and yet you have yet to produce even a single paper. Can we therefore assume that when you wrote that you can only find satellite data that affirm your beliefs about desertification, you were fabricating? Were you also fabricating your claim that you have data that say crop/food quality declines with higher CO2? Did you find this “data” on a blog, or was it a peer-reviewed scientific paper? If the latter, let’s see what you have. Were you also fabricating your claim that the oceans have been “acidifying” so fast in the last 200 years due to human CO2 emissions that it is harming the oceanic biosphere? If not, produce the science that supports this claim of yours. If you can’t, we’ll just assume you were fabricating that claim too. Why don’t you support your beliefs with scientific data, SebastianH? Why do you just take these shots from afar and then scamper off when challenged? The articles that get posted on this blog trying to argue against AGW over and over by repeating the same ridiculous statements. Would you guys need to do that if you felt that you are taken serious by anyone? Honestly, I think most of the skeptics here don’t concern themselves with how people like you view us. So if your interpretation of our behavior is that we’re trying to be taken seriously by those who maintain the belief that humans control the weather and the oceans’ heat content and sea ice extent and sea level rise (10 feet by 2065!) and species extinctions (1 million by 2050!) by emitting more or less CO2…you are quite mistaken. We are amused that you have so little to offer in the way of substance, how you cannot back up your beliefs with scientific publications, and how much you and your side instead relies on models and hypotheses and name-calling and scare tactics. On the other hand, it isn’t quite so funny when we think about the high costs of energy and the effects “green” policies have on the poor. Within the last year or two, I have had personal communications with several scientists from all over the world in response to some of the articles written here. It would appear that they take the work we do here seriously enough to reach out to us. I derive some satisfaction in that. No seb, that is what YOU do. You just keep yapping your child-minded anti-science AGW mantra. ZERO-SCIENCE to back it up. But so egotistically bent that you can’t see it. Still dodging any actual SCIENCE to back up anything you say, hey seb. Oh, oh! The chatbot has a recursive loop in it’s “not taken seriously” subroutine. Reminds me of this little gem…. CO2 is ONLY a problem because there needs to be more of it. And we do call the warming what it is. Totally natural, and highly beneficial. It is the continued lies and mistruth of the AGW Agenda, and its loudly spoken one-world totalitarianism that is the problem. You know you are irrelevant. So not much room left for the CO2 “thermostat”. That is a surprise (not)! Now let’s listen to the ad-hominems and liberal head explosions. At times like these, perhaps it will be seen as a kind gesture to toss them a bone, Dennis (smile). They say further study is warranted. Should be interesting. 99% of Warmists will not read any scientific paper that does not support their position. Which is why it is so important that sites like this, and a growing number of others, keep showing these scientific papers. Papers that without Pierre’s and Kenneth’s hard work would not see the light of day and be drowned out by the nonsense proposed by the likes of the ever litigious Michael (hide the decline) Mann, Kevin (we can’t account for the lack of warming at the moment and it is a travesty) Trenberth, Phil (Why should I make the data available to you, when your aim is to try and find something wrong with it. )Jones, or ever quotable nonsense of James (runaway greenhouse gas effect, boiling oceans, NY will drown by 20whenever, etc.) Hansen, and of course the ready chorus of noisy “me too” ‘idiots with a Doctorate’ offering nothing to the advancement of science. Thank-you Pierre and Kenneth for keep questioning the science, keep questioning the misanthropes message. By citing a paper written by the author himself which has only this one citation. Hmm … pretty weak when you consider that it is well established that CO2 concentration varied with temperature. Something which one would expect considering the physics at the ocean/atmosphere interface regarding CO2 concentrations. and that the amplification of CO2 concentrations yields increasingly smaller radiative effects, meaning that the higher the CO2 concentration rises, the weaker its influence. And the author ignores that it is a cumulative effect. When you get a RF of x W/m² from 280 to 340 ppm and y W/m² (with y being smaller than x) from 340 ppm to 400 ppm, those x W/m² don’t just disappear. And your intepretation is lacking too … “diminishing returns in marginal radiative forcing” don’t mean that the influence gets weaker as the concentration rises. But maybe that was just poor wording on your side? Which is a weak argumnent. There also has not been a better explanation than the big bang having started it all. You can try find a better explanation, but you can’t argue that it is wrong because there has been not better explanation yet. Kenneth, I’d very much like to know how do you discover these papers? You can’t possible be reading every paper out there. So do you have some favorite authors? Search terms for paper titles that need to match? And then, what is the process of determining if it would make a case for AGW not being real? What’s the minimum barrier? This is just revolting. Dr. Davis has 93 reference papeers in his 2017 paper entitled “The Relationship between Atmospheric Carbon Dioxide Concentration and Global Temperature for the Last 425 Million Years” to support the conclusion that there has been a decoupling of the CO2-temperature connection during much of geological history. It’s a form of intellectual dishonesty to claim that there is only “one citation” to support this conclusion when there is a reference list of 93. Obviously, you didn’t even look at the paper before hurling this baseless accusation. And who are you to complain about a lack of sources to back up one’s claim? You routinely claim you have “data” to back up your beliefs…but then fail to produce any when you are asked to do so. it is well established that CO2 concentration varied with temperature. Yes, as volumes of scientific papers have affirmed, the CO2 concentration change lags the temperature change, meaning that the CO2 is not modifying the temperature as much as the temperature is modifying the CO2 concentration. I can produce several dozen scientific papers to back up this conclusion. And the author ignores that it [the weakening influence of CO2 with higher concentrations] is a cumulative effect. And your intepretation is lacking too … “diminishing returns in marginal radiative forcing” don’t mean that the influence gets weaker as the concentration rises. You can try find a better explanation [than AGW], but you can’t argue that it is wrong because there has been not better explanation yet. Um, you’ve got it backwards. Dr. Davis is saying that your side is prone to claim that humans are heating up the oceans by burning fossil fuels because no alternative explanation for the +0.09 C temperature change since the 1950s has been better than the anthropogenic one. Also, the physics are sound. So then why don’t we have physical measurements from a real-world scientific experiment that shows how much water bodies cool or warm when CO2 concentrations are lowered or raised in the air above them? Why is this a modeled conceptualization only? Kenneth, I’d very much like to know how do you discover these papers? I enjoy reading about climate (especially paleoclimatatology) and scanning the scientific journals on a daily basis has become a hobby. Also, as an advocate for poor and disadvantaged people and humanist, I am very concerned about the harm that “green” policies are delivering to the world’s citizens, especially to the poor. So that is my main motivation. I view the tactics of people like Michael Mann, James Hansen, Al Gore, Phil Jones…as impediments to human progress. Obviously, you didn’t even look at the paper before hurling this baseless accusation. Did you look at the paper? Do you find it convincing for a scientist to write one paper, come to a conclusion that nobody is citing and then cite this conclusion as basis for another conclusion in the next paper? Do you feel confident that this research is correct? And yet you don’t understand the mechanism behind this. The physics behind this aren’t that difficult and arguing against it with allegations of no evidence supporting it, etc … is just funny to an outsider (like me) of your particular bubble. Is the sum of this term getting smaller (weaker) when you continue that equation? Because it requires a second Earth? You base a lot of your argument on proxies, why can’t you understand the physics of these mechanisms and instead try to come up with the most far fetched explanations ever. It’s like seeing a stove being heated by a fire and trying to find alternative explanations of why whatever is cooking on that stove is cooking. Backward facing skeptics who “feel” that everything was better in the past and nothing needs to be changed … that’s what is impeding progress, at least if anyone really takes you guys serious. Did you look at the paper? Yes. It’s in the list of 485 (actually 490). The 2017 paper was only published a few months ago. Expecting citations immediately is a little unreasonable. Besides, what he writes isn’t even controversial. During the millions of years spanning the Ordovician, for example, CO2 concentrations were in the 4,500 ppm range…while the Earth’s land masses were covered in ice sheets. This was not an example of a coupling of CO2 and temperature. I think it is revolting to post papers like these and claim that AGW is nonsense because of it. That isn’t my claim. I don’t use the word “nonsense” like that. And a single paper is not the reason why I (or anyone else) would question the hypothesis that humans control ocean temperatures with our CO2 emissions. So again, you’re just making up stuff. So you think that what you wrote above more accurately reflects his statement than what I summarily wrote: “the amplification of CO2 concentrations yields increasingly smaller radiative effects“? Because it requires a second Earth? We don’t need a second Earth to test whether CO2 concentration changes heat up or cool down water bodies. But if we have no real-world evidence affirming the hypothesis, why do you nonetheless claim it is not modeled or theoretical or hypothetical? Please identify the instance in which I or anyone else has written that “everything was better in the past” and “nothing needs to be changed”. I don’t use that language (“everything” and “nothing”). Once again, you have been caught fabricating statements/positions that no one has written. The Ordovician period ended in a temporary ice age , but prior to that the temperature anomaly was 2C . Why the temperature was relatively low despite a CO2 concentration 10 x the present is presumably due to a low solar input. However if 400 ppm causes people to expect the death of shelly organisms and corals , it is not obvious why , when the concentration of CO2 was 4000ppm the Ordovician was a period when coral reefs thrived as did organisms with carbonate based exoskeletons. seb shows that CO2 warming is totally limited. No seb, only a couple of hundred years ago, a lot of the world was in the grip of a cold bleak period. Plant growth was limited, crop failures lead to devastating famine. Fortunately since then , there has been a bit of highly beneficial warming. Hurricanes are down, plant life is luving the extra CO2 , modern capitalist society is the cleanest and least polluting it has ever been. Life is good for many more people now than it ever has been. We live in probably the most benign climate period in human history, let’s hope the coming cooler period doesn’t change that too much. This is what the Marxist/Greenies and their AGW Agenda seek to destroy, economically, socially and environmentally. They have stated, from their own mouths that they have a socialist totalitarian agenda, which will destroy modern capitalism and level the social construct by taking everyone back to third world status. That AGW Agenda is also holding people back in desperate as the World Bank stops funding for fossil fuel power in third world countries. It is a sick, evil agenda that you worship, seb. Of course the religious cAGW true believer would press such an argument, as they are not interested in science or understanding it. They are, in the main, interested in disrespecting any messenger, and deprecating any message that does not hold to their beliefs. That is how religious ideologues function — with no rationality, comprehension, or thought. Of course the basic idea used is the same as the notion that ‘consensus science has merit’ — i.e. popularity = correctness. Therefore, the reasoning goes, an increasing number of citations of any particular paper means it must be increasingly correct, or maybe diminishingly incorrect. Fortunately just a quick look at the site ‘Retraction Watch’ (http://retractionwatch.com/) shows this is often not the case, as some very popular, and heavily cited papers have been completely debunked/retracted/ or exposed as fraudulent over the years. This is the mark of real science in action, reducing the rubbish from the meritorious. Sadly due only to political momentum, ‘climate science™’ has yet to fully undergo the academic equivalent of threshing, winnowing, sieving processes. Only room for one total void. Your comments are EMPTY baseless rhetoric, ALWAYS, seb. And as you well know, there is absolutely NO empirical evidence that CO2 causes any warming WHAT-SO-EVER, in our convective atmosphere. I can only speak for myself but I am becoming bored and occasionally distracted by the meaningless ramblings from Seb. Would it be possible to have a vote on whether we should continue to be distracted in this way? Don, simply do as I do and do not read the SebH ramblings because he is suffering from Idee fixe. No amount of pointing out the false notion of AGW will change his opinion. He is of course entitled to an opinion, right or wrong. He reminds me of the anti-Vaccers,( no evidence of harm) and alternative health groups for which there is absolutely no evidence of efficacy. As a side note : as I look from my back deck in suburban Bondi, I can count 19 trees. All are looking green,strong and healthy. Why is it that the ramblings of ‘SebastianH’ remind me of David Appell? Have the two ever been seen in the same room together? If they were ever in the same head together, they would have PLENTY of room to spare. When I was an undergraduate studying physical geography I was taught a theory of mountain building that I believed was non-physical. The theory was that isostacy could produce mountains. When I began graduate studies, I started using plate movements to interpret landforms but had to be very cautious about how I did so. The reason was that anyone who hoped to teach at a North American University had to conceal his/her interest in continental mobility (aka continental drift). By the time I had shifted to economic geography most scientists had accepted the theory of plate tectonics. That scientific revolution occurred in about 5 years. My experience in the 1950s with continental mobility is what enables me to reject the anthropogenic global-warming hypothesis, which I view as based mostly on confirmation bias. However, my position is that what needs to be explored as an alternative hypothesis is the role of water vapour in cloud formation that leads to variable Bond albedo. The leading hypothesis is that of Svensmark and others who attribute variable cloud formation to galactic cosmic rays (actually particles). When will Voyager 1 and 2 cross the termination shock? Izmodenov, Gloeckler, and Malama, Geophysical Research Letters, 2003. Our Solar System moves through a warm (∼6,500 K), partly ionized local interstellar cloud (LIC) with a relative speed of ∼26 km/s. The solar wind interacts with the LIC to form a cavity around the Sun called the heliosphere. The solar wind meets the interstellar charged component at the heliopause, where solar wind pressure balances the pressure of the LIC. Before reaching the heliopause, the supersonic solar wind is decelerated at an extended shock wave, the heliospheric termination shock (TS). The two Voyager spacecraft are cruising away from the Sun and approaching the termination shock. Here we present predictions of when the Voyagers will encounter the termination shock by calculating the position of the TS using a numerical multi-component model of the heliospheric interface and improved measurements of interstellar H atoms. Interstellar atoms penetrate into the heliosphere where they are ionized and detected as pickup ions by the SWICS instrument on Ulysses. We conclude that the most probable crossing of the termination shock by Voyager 1 will occur between 2007 and 2012. End of abstract. The spacecraft have already met the LIC which the solar system is passing through and has been passing through for an undetermined time. Jasper Kirkby designed the CLOUD experiment at CERN to test the hypothesis that GPR particles are capable of forming clumps large enough to act as cloud condensation nuclei. There are so many holes in the Catastrophic Anthropogenic Global Warming (CAGW) hypothesis I’m constantly amazed it has persisted for so long. I’m sure it wouldn’t have done so without the complicity of the media and the successful dumbing down of our children in math/science over the last few decades. Based on his inability to understand the diminishing warming effect of additional CO2 in the atmosphere, SebastianH is likely a product of this dumbing down of the populace. The numerical series he uses in his argument, “1 + 1/2 + 1/4 + 1/8 + …..”, does indeed trend higher and higher as long as you keep adding terms. However, in the real world, you can’t keep on adding manmade CO2 to the atmosphere indefinitely because there simply isn’t enough fossil fuel available. Scientists argue over something called Climate Sensitivity, by which they mean how much the global temperature rises for each doubling of CO2 in the air. Figures anywhere from 0.5 deg.C to 6.0 deg.C have been bandied about – with CAGW alarmists tending toward the higher end. Most rational analysts (at least from my reading of the subject) seem to be settling on a figure between 1 and 1.5 deg.C. The Michael Manns and Kevin Trenberths of this world keep telling us it’s double that amount. For some reason no one has yet explained, a temperature rise of 2 deg.C is touted as disastrous, although for most of the last 600 million years Earth’s temperature has averaged around 6 deg.C warmer than today. Doesn’t this strike ANYONE in the media as somewhat odd?! But if we look at the actual data, we get a much better idea of the practicalities of the situation. According to most sources, again, we are approaching ‘peak oil’, a point at which production will tail off rapidly. Gas supplies will follow, and coal too. So, even if we extract all the fossil fuels we can reach over the next 100 years, it’s just not conceivable we will be able to double atmospheric CO2 to 800 ppm. That would require us to add over 3 times more CO2 to the air than we’ve (purportedly) managed to add in the last 168 years! And even if we managed to do it, against all logic, it’s doubtful that Climate Sensitivity would cause temperatures to rise by more than 1.5 deg.C anyhow! And don’t forget, Earth’s land plants evolved 400 million years ago, when there were over 2000 ppm CO2 in our atmosphere. Since then, Earth’s photosynthesising vegetation has enjoyed CO2 levels averaging 1500 ppm – nearly 4 times what we have today. In fact, horticulturists routinely raise the CO2 in their greenhouses to around 1500 ppm because the crops LOVE IT and thrive on it. So you can see, that even at 800 ppm (impossible anyway), the air would have much less CO2 in it than at almost any other period in our planet’s history, and only half what green plants prefer. The logic is inescapable. We don’t need less CO2; we need more.